In my last Little Detours post I mentioned that I was considering introducing bookish content here this year. 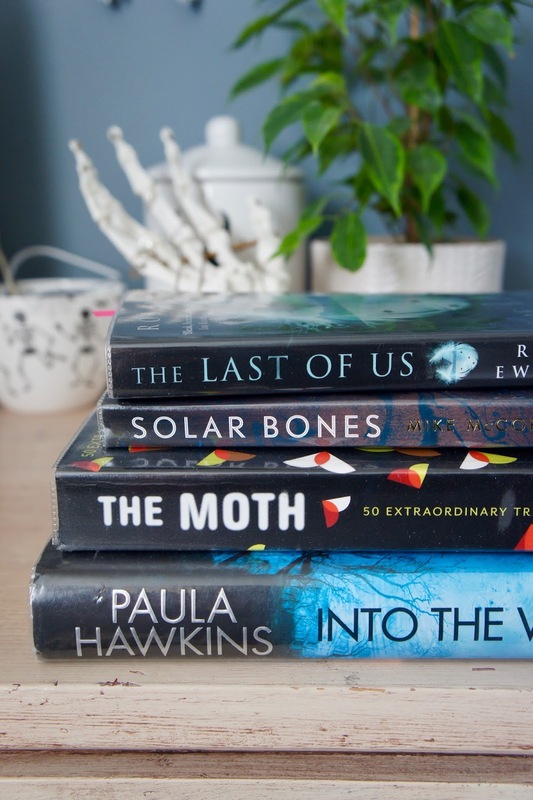 Whilst I tend to save the book-related posts for my other project Blogger's Bookshelf, I'm currently on top of my BB schedule so it seemed like the perfect time to start talking books here as well. Although it's always lovely to treat yourself to a new book I also believe that reading shouldn't have to be an expensive hobby and am a huge fan of using the library. Luckily my local library has a great selection, as well as offering reservations and shipping in from other libraries across the county free of charge through their online catalogue. So, to help me kick off the new reading year on a positive note I decided to check out a few of the titles that are top of my TBR. I've enjoyed dystopian novels in the past but didn't really reach for them in 2017 so I thought it might be a nice change to revisit the genre this year. This dystopian novel which tells the story of a group of children left behind on a remote island after surviving a pandemic, comes highly recommend by fellow bloggers like Michelle and sounds like an interesting take on the genre. Lately I've really been enjoying short story collections and stumbled across this one whilst browsing the shelves at Waterstones a few months back. Including fifty true stories told by people with all kinds of tales to share, the book sounds like a fascinating read and I'm excited about the variety of stories it promises. Another genre I enjoyed in 2017 was thrillers and I've heard some pretty good things about Paula Hawkins' latest release. I understand that the story is told from multiple points of view and the biggest criticism I've seen from reviewers is that there are perhaps too many to keep up with. Despite this, I'm looking forward to seeing how the mystery will play out. Celeste Ng's latest release has been everywhere over the past few months and I've finally managed to get hold of a copy from the library. Whilst I enjoyed Everything I Never Told You overall, I feel like the premise of Little Fires Everywhere - described as a 'deep psychological mystery' by Reese Witherspoon - is much more my kind of read and I can't wait to dive in! The third and final book in the 5th Wave series is one of the sequels I've added to my reading goals this year (the rest of my list will be published over on Blogger's Bookshelf later this month). This YA dystopian series takes place in a time where aliens have destroyed life as we know it and follows Cassie and co as they try to navigate this new world. I had mixed feelings about the first two novels but am looking forward to finding out how the story ends. Honestly I don't know much about this one but the mystery surrounding this prize-winning novel certainly has me intrigued. The book doesn't have chapters or punctuation and takes place over just one hour which is a concept I really love. Over on Blogger's Bookshelf I recently talked about stepping out of your reading comfort zone and I feel like this book will be one of those reads for me.